Russell Blackford seems to like the fact that a recent Pew survey shows more Americans are getting wary of religion in politics. So do I. I am offended by the view that religions should have privileged treatment under the law and I disagree strongly with many of their other views on how society should be run. So I am happy to see any move towards defeating those views. But I am not so keen on the wording which suggests that people are prepared to say that churches should not express those views. I am happy to see that Blackford, too, is not actually opposed to the churches expressing views on political matters, but I don’t understand why he thinks their expressed views should not be based on theological considerations. Shouldn’t they have the same right as any other group to express views that are ill-founded and wrong? This ‘debate’ at The Chronicle Review came to my attention via Jean Kazez and Russell Blackford. The fact that Facebook Co-Founder Chris Hughes has purchased The New Republic is a good sign that those who bewail the impact of the web on serious writing. This New Yorker article gives a nice blend of personal, scientific, and species history. It would be interesting to know if what we picked up from our bigger brained but ultimately less successful cousins was just random or if it includes anything useful. And as to the question of how “we” won, I am still inclined to speculate that there’s some kind of tie in between our capacity to learn from and cooperate with peers, a willingness to take direction from others (sometimes “blindly” so), and the tendency towards art and decoration – especially that of our own bodies to help identify “team” members in conflict situations. But now it looks as if the competitive team spirit and blind obedience to authority that won us the world may be about to become our undoing. It would be ironic if some admixture from the Neanderthals were to be what we need in order not to destroy ourselves in religious conflict. Some minds are changed a bit, and I think for the better, by this LinkedIn discussion, but it also includes a good example of exactly what I was concerned about in my comment on Keith Devlin’s original piece on the topic. Should kids be told that multiplication is repeated addition? | LinkedIn. The question posed is a real paedagogical question to which I don’t think we know the answer, and the discussion led to some interesting examples of ways that the scaling interpretation of real number multiplication might be conveyed to small children . I don’t think it’s yet clear how early they can truly identify and compare different geometric magnitudes (viz experiments comparing volumes for example) but this is certainly a worthwhile area for research. Part of what turns people against mathematics is the certainty of its results which means that one’s mistakes are hard to hide. But what’s even worse than being found indisputably wrong when wrong is being told with a claimed mathematical level of authority that one is wrong when one cannot understand the argument. And I think Devlin’s campaign against “repeated addition” makes it more likely for children to be exposed to that kind of dogmatic smackdown. My objection to Devlin is that he claims as mathematical fact positions which are essentially philosophical. He makes no attempt to show any inconsistency in the definition of multiplication of natural numbers by a recursive algorithm of repeated addition, but just claims in his first piece that this doesn’t capture what might be called the “essence” or “real meaning” of the corresponding operation on the reals and in his most recent effort he makes the claim that recursion is not a case of repetition. While not mathematically provable, either of these may indeed be a reasonable philosophical position (though I don’t subscribe to either of them). And they may have valid paedagogical implications (which I might agree with despite not agreeing with his philosophy). But I have always suspected that the way he said it would encourage people to dogmatically insist that repeated addition is “not multiplication. Not in any sense; not even on the naturals”. And unfortunately there was an instance demonstrating just that in the course of the LinkedIn discussion. It is perfectly fine to follow the “Yes!” with some thing like “and here are some things we can use it for..” (see the wonderful poster by Maria Droujkova for some nice examples) . And of course these may include, as Maria does, examples which help to prime the student for seeing things another way. But it is up to the student to eventually see the next step, not for the teacher to immediately suggest that she has somehow fallen short. The Tyee’s David Beers has a nice story about the guy who was cheated out of the Vancouver Mayor’s chair in 2005. But not, I’m afraid, in a good way. Less Wrong comes down on the wrong side of the “Sleeping Beauty” problem. Sleeping Beauty volunteers to undergo the following experiment and is told all of the following details. On Sunday she is put to sleep. Afair coin is then tossed to determine which experimental procedure is undertaken. If the coin comes up heads, Beauty is awakened and interviewed on Monday, and then the experiment ends. If the coin comes up tails, she is awakened and interviewed on Monday and Tuesday. But when she is put to sleep again on Monday, she is given a dose of an amnesia-inducing drug that ensures she cannot remember her previous awakening. In this case, the experiment ends after she is interviewed on Tuesday. The intent of the problem is presumably that she NOT know what day it is until after giving her answer and since in a sequence of repetitions of the experiment there are twice as many expected wakeups for tails as for heads the probability of head on any given wakeup is 1/3. If Beauty was told the coin came up heads, then she’d know it was Monday. If she was told the coin came up tails, then she’d think there is a 50% chance it’s Monday and a 50% chance it’s Tuesday. Of course, when Beauty is woken up she is not told the result of the flip, but she can calculate the probability of each. When she is woken up, she’s somewhere on the second set of branches. 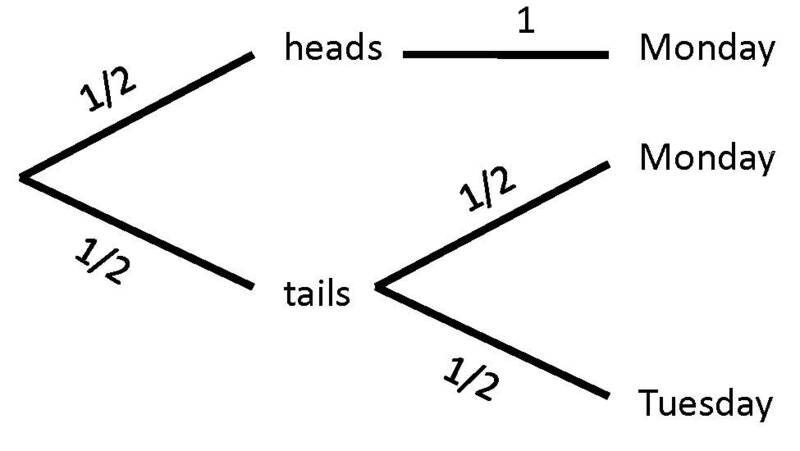 We have the following joint probabilities: P(heads, Monday)=1/2; P(heads, not Monday)=0; P(tails, Monday)=1/4; P(tails, Tuesday)=1/4; P(tails, not Monday or Tuesday)=0. Thus, P(heads)=1/2. The problem with that tree diagram is that it really just amounts to giving a long calculation to prove what she already knows (or at least has been told) – namely that the coin is fair. If so then of course the P(H)=.5 but that question is even less interesting than the cases in which she is told what day it is. The actual question we are asked is what credence she should attach to the statement that when she wakes up she will be shown a head, and both Richard Neal’s gambling approach and Nick Bostrom’s extreme case should make it clear that the answer is 1/3. You are currently browsing the alQpr blog archives for March, 2012.